The trail begins across from the Visitor Center. The sun was just peeking over the mountains. We passed a group on a Ranger led hike. Hikers ahead on the switchbacks. From a distance, these stone reinforcements blend right in with the rest of the rocks. Looking back at the view from part-way up. The trail comes out on top of a mesa with great views all around. The pointed mountain is The Watchman. There is a loop trail around the top of the mesa. This side looks down on the campground and up Zion Canyon. Looking back on the trail we came up. On the other side you can see the town of Springdale. And a good view of The watchman. Back down in the canyon it was getting very hot...high 90s. Time to get in the river or leave for cooler climes. We left...heading north to higher, cooler places. 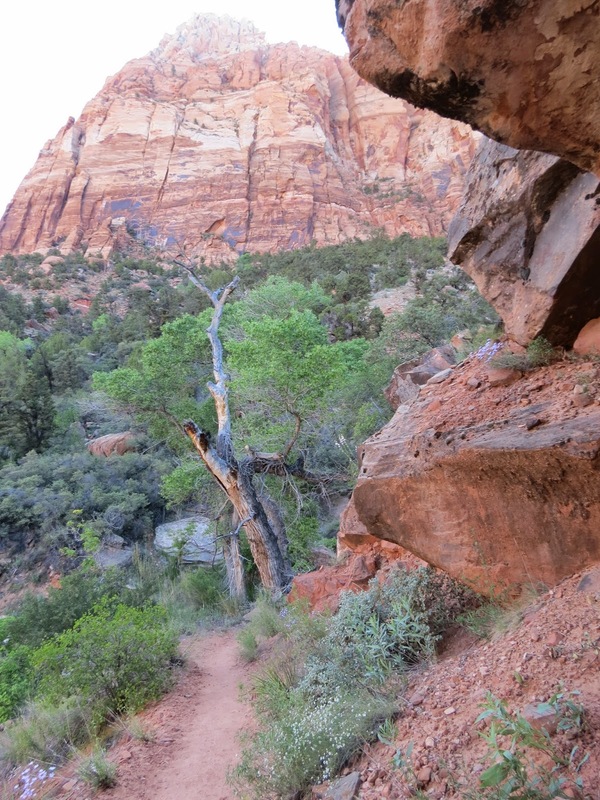 But we had a great time exploring Zion, and left several trails not hiked.